Earlier today I ran a quick test to let you hear the audio quality. Both sound clips were recorded in my office (hence background noise), and were not EQ’d in post. These are raw files right off the SD card. The internal mics on the DR-40 sound really good. The mids are crisp, and articulate. I have a thin voice to begin with, so I don’t typically sound well recorded, but I feel like the recorded sounds magnificent. I used my Blue Mic Yeti Pro to record this clip. The Yeti sounds sooo good. The warmth of the lows really help give you a “radio voice”. 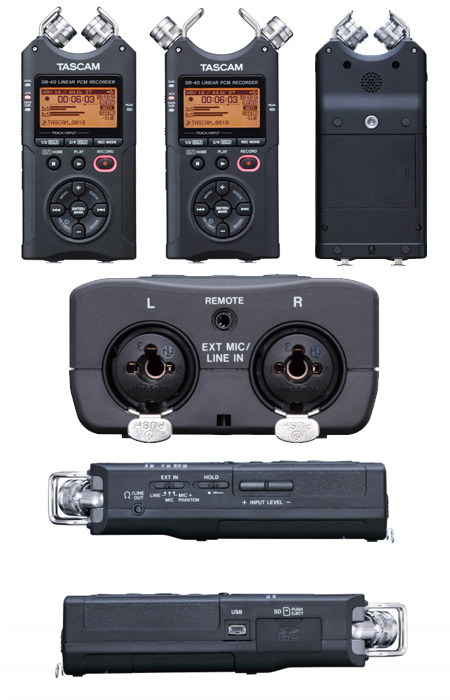 For $179 (this is the price my local supplier quoted me) the Tascam DR-40 is a steal! If you have a serious need for portable recording this is the answer. Aw, man. I thought those were tasters when I first looked at them. I could use a good taser for my Wednesday night service.